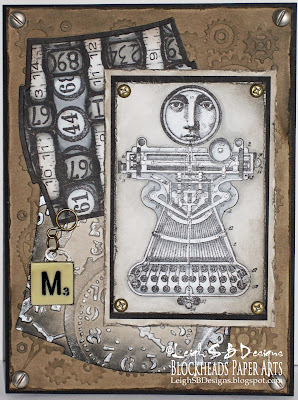 Velvet Paw Creations: "Measure" Steampunk card featuring Lost Coast Designs - A Blockheads DT project! 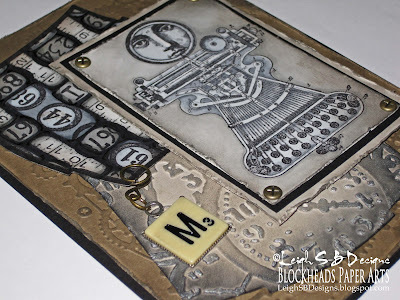 "Measure" Steampunk card featuring Lost Coast Designs - A Blockheads DT project! 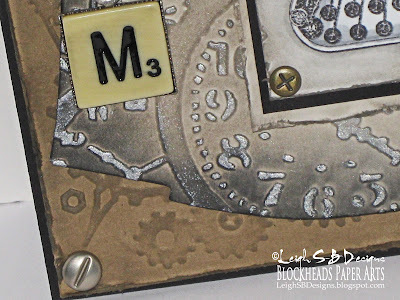 Steampunk is definitely one of my favourite stamping themes and I had a blast getting my Steampunk action on with this card ;0) Here's another project for Blockheads' upcoming newsletter feature on creating with Border Stamps featuring Borders by Lost Coast Designs! Steampunk Typewriter Girl, Measuring Tape border, Bingo border and Numbers border. (from left - photo 1) Draw faint grid lines in pencil or eye ball the placement of the borders based on the size of the stamps on a sheet of Neenah Solar White cardstock. 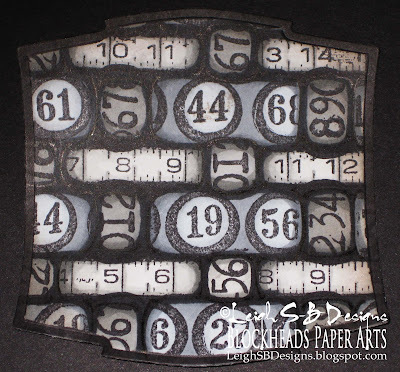 Mask off alternating horizontal stripes with low tack tape and stamp the Numbers border with Tuxedo Black Memento ink. Remember to leave a gap between each vertical stamped stripe. 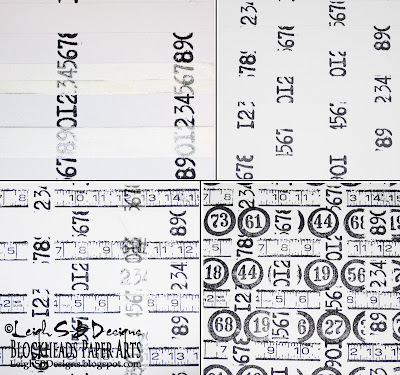 (photo 2) Mask off the horizontal stripes that now have partial stamped numbers and stamp the Numbers border again filling in the gaps left in the first step. You can see the weave pattern is already starting to form. 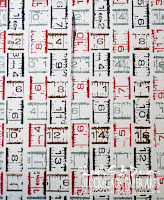 (left - photo 3) Repeat the same steps but this time mask off the vertical stripes and stamp the Measuring Tape border. 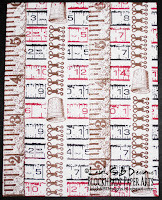 (photo 4) Alternate the masking and fill in all the blank spaces by weaving in the Bingo border. In retrospect I think the circles kind of mess up the illusion of the weave and I much prefer the weave pattern I created with just the Measuring Tape border. It probably would have been more effective if I'd left a wider stripe for the Bingo border but I still like it though and ran with it. Colour the weave pattern with Marvy Le Plume Permanent markers (or Copics) with a monochromatic colour scheme. I used 3 Marvy Le Plume Permanents cool greys (CG892, 894, 895) and 3 warm greys (AG871, 873, 875) to colour the borders and N910 black to colour the background spaces between the borders and to further enhance the illusion of the weave. Die cut out the design with a Spellbinders Labels 2 die and emboss with the Spellbinders Tan Embossing Mat. Colour the debossed edges with the black marker. 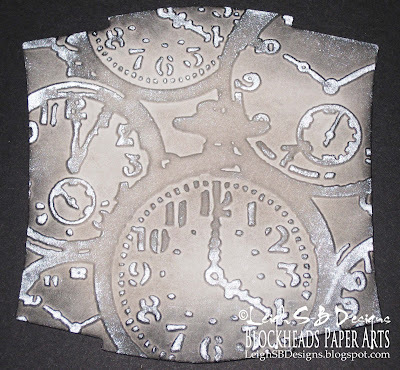 Die cut out a larger Spellbinders Label 2 die from a piece of the greyish-brown cardstock and emboss with the Tim Holtz Alterations Texture Fade Clocks embossing folder. Apply Pumice Stone Distress Ink directly to the embossed design, then highlight areas with Silver Brilliance Ink, then edge the die cut with Black Soot Distress Ink. 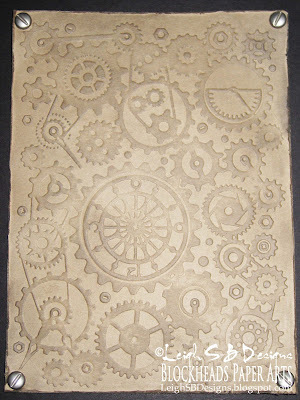 Cut a rectangle panel from a sheet of tan cardstock and emboss it with the Cuttlebug 5 x 7 Clockworks embossing folder. Distress the edges with the Distress Tool and apply Pumice Stone Distress Ink to the embossed design and the edges with the direct to paper method. Punch small holes in the corners and attach silver Flat head screw brads. 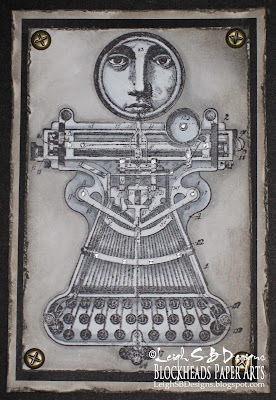 Make a folded card from black cardstock and adhere all the elements together with double sided tape and then adhere the Steampunk Typewriter Girl panel in place with pop dots for dimension. 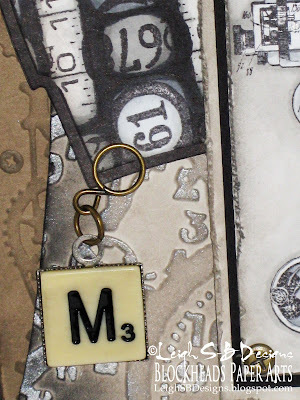 Attach a Bead Landing Found Objects Scrabble tile charm (Michaels) to a Tim Holtz Idea-ology charm clip, mix and matching the antique brass and silver metals of the screw heads. Closer look at the screw embellishments. FYI Tim now has a range of mini screw head brads in his Idea-ology collection! Thanks for visiting with me today! For more Stamping with Borders inspiration also check out what my design team mate, Karen, has created with one of my ultra favourite themes - Alice in Wonderland. Just a quickie reminder that there's only a few days left to join the Blockhead's Magic Metals Technique Challenge - get all the info here. There's prizes up for grabs for Blog Hop entries and Blockheads' Facebook entries so come join the fun! MyGrafico Crafts - Challenge #125 - Fun And Games - Hope my use of the Bingo Border qualifies!? I totally love it! The black, withe and brown makes a beautiful color combo! I saw this on the SSS blog, it's fantastic. I love all the gorgeous layers & textures. This is awesome, Leigh! Love all the elements! So cool! You blow my mind, the way you interweave those LCD borders, Leigh! So cool. So cool! love the boarders! Such a beautiful card is this. Lovely colors and image! Thanks for joining us at Stamptacular Sunday and hope to see you back soon for some more challenge fun! I adore this card! All of the elements came together so nicely...FAB work. Thanks so much for joining us at the Stamptacular Sunday Challenge! This is a fantastic card! So much detail and so very steampunk! Thanks for joining us at MyGrafico! Fabulous Steampunk, Hun. Love all the cool details. Thanks for joining us at CYP this week. such a great steampunk card, I love all the details and the basket weave background is just great and really suits the card. Thanks so for sharing the steps. Fab card, love all the techniques. WOW, is all I can say - what an amazing card! Thank you for joining us at Lexi's Creations this time! Gorjuss colours and just perfect for our Earth Tone Challenge! I'm a Winner at Smudgy Antics, Woohoo!